This week I taught one of my favorite classes…a traditional Irish menu for St. Patrick’s Day. American’s seem to love St. Patrick’s Day….and they celebrate with gusto. The tradition of marking the day with a platter of corned beef and cabbage is firmly entrenched. But my understanding is that in the land of St. Patrick himself, this is not the dish upon which most will feast. Irish tables are more likely to feature a hearty beef or lamb stew. Cabbage might appear, but will probably show up folded into a dish of fluffy and buttery mashed potatoes. So rather than follow the traditions of my own country, I have hopped back over the Atlantic for my St. Patrick’s day spread….one that features soda bread, colcannon potatoes, a delicious Guinness beef stew and a double-crusted lemon curd tart. The stew that I make for our St. Patrick’s Day meal is a simple—and to be honest, classically French—beef stew featuring Guinness and root vegetables. A few years ago I wrote a post detailing the basic processes of braising and stewing. 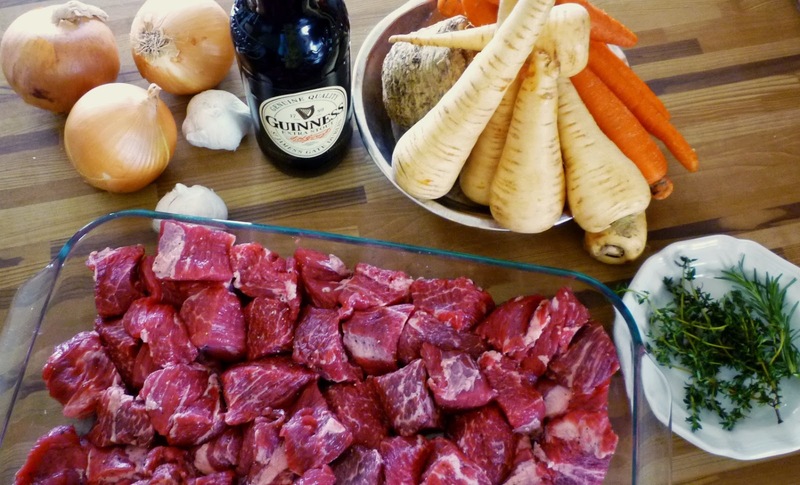 If you have never made a stew before, this post would be a great primer—all of the rules that apply to the red wine-based stew that I posted then would apply to this Guinness stew. 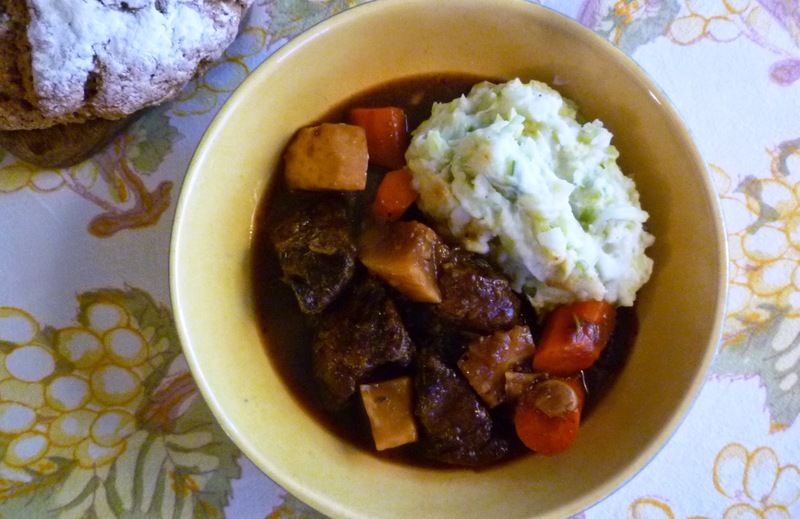 It is the Guinness—not the technique—that plants this stew firmly in Ireland. It is worth noting that even though this stew is Irish because of the ingredients, it would not be correct to call my Guinness stew “Irish Stew”. A traditional Irish stew is a baked casserole of layered onions, potatoes and lamb. Occasionally a few carrots are added. It is a rustic and delicious dish…and if I don’t make Guinness stew, this is the stew that I make. My favorite example of it can be found in the March 2004 issue of Martha Stewart Living. Because I can’t help myself, I do make a couple of changes to her recipe. First, I brown the lamb and soften the onions (in the same pan in which the lamb has been browned) prior to layering everything into the casserole. Then, I add two or three large carrots—peeled and cut into thirds—placing them on top among the whole potatoes after the stew has been in the oven for an hour or so. 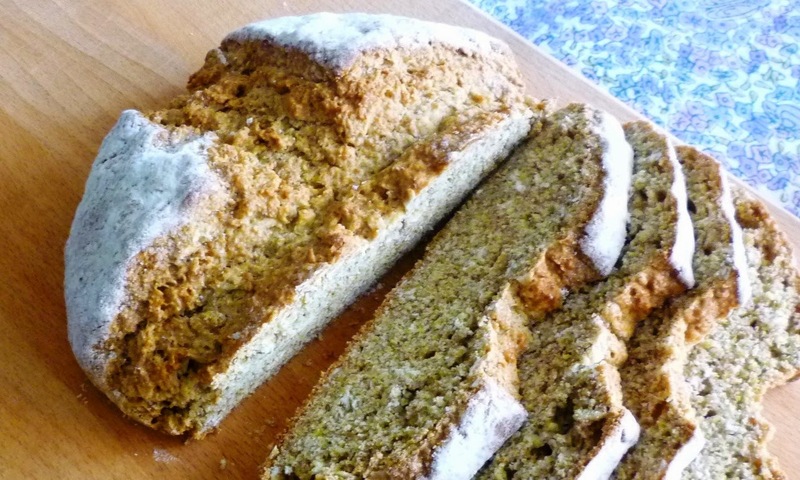 I have already posted the recipes for Brown Soda Bread and Colcannon potatoes. I will only add here that I am always…. always ….struck by how delicious these two foods can be. People who think they don’t like whole grains will enjoy this bread—slathered with a generous quantity of sweet (unsalted) butter. The same goes for the potatoes and those who think they hate cabbage. The glory of Irish cooking is its simplicity and its connection to the land—which produces soft, low-protein wheat, oats, rich dairy products and abundant cool weather crops (among other things). These things are on full display in these two dishes. If you have never tasted either of these foods, you should definitely give one…or both…of them a try. I finish my Irish menu with a double crusted lemon curd tart. This recipe is from a column that ran in Bon Appetit in March of 1992. The author of the article (Gerri Gilliland) was raised in Ireland but was living and working in the United States as a chef. Her article was written to introduce Americans to a more traditionally Irish St. Patrick’s Day feast. Because I was curious to see how much I had altered her tart recipe over the years, I pulled my copy of that issue this week. I was gratified to discover that our menus are almost identical. In fact, the origin of my Guinness stew is probably her recipe. I have altered both the stew and the tart over the years, but not so much as to make them unrecognizable from the originals. I am pleased to give her credit. As Gilliland points out in her article, this menu is perfectly suited to a weeknight party. (Serendipitously, in the year her article was published, St. Patrick’s Day fell on a Tuesday…just as it will this year.) For the tart, the lemon curd should be made the day before (so it will be thoroughly chilled)—and the dough can be made—and even rolled out—the day before. It is then a simple matter to fill the crust and bake the tart after work. The stew can also be made ahead—in fact, it is better this way since this allows the flavors to develop more fully. Simply make the stew on Sunday or Monday, cool it down and then before reheating, scrape any solidified fat off of the top. Bring it to a simmer over very low heat—or in a low oven—while you are making the Colcannon. If you would like to greet your guests with an appetizer, Gilliland suggests that nothing is more Irish than a platter of thinly sliced smoked salmon to accompany your brown soda bread. Barring that, a nice platter of Irish cheddar or Dubliner cheese would be good too. Whether you prepare all—or even just one—of these dishes, I hope that you and your family and friends will take the opportunity afforded by this holiday to gather at a table and experience the traditional tastes of the delicious foods of Ireland. Happy St. Patrick’s Day! Season the meat generously with salt and pepper. If time allows, season the meat up to 24 hours ahead. Wrap and refrigerate. Dredge in flour and shake off the excess. In a wide deep sauté pan or Dutch oven, heat some of the oil over medium-high heat. Add the meat and brown on all sides. Don't crowd the meat in the pan. If necessary, brown in batches, removing each batch to a plate while you do the next. It will take 10 to 20 minutes per batch to brown the meat. Regulate the heat as necessary to maintain an active sizzle—it shouldn’t spatter and smoke. Add the root vegetables and continue to simmer, covered, until the meat and vegetables are tender (another hour or so). Taste and correct the seasoning with salt and pepper. Remove the herb sprigs before serving. Note: If you prefer a thicker stew, you may thicken it with a roux after it is done cooking. To prepare the roux, melt 2 T. of butter in a small saucepan. When foam subsides, whisk 2 or 3 T. of flour. Cook stirring constantly for a minute or two—the roux will be bubbly and straw yellow. Remove from the heat. You may use the roux immediately, or let it solidify and use it later. To thicken the stew, place the stew over moderate heat. Maintaining a gentle simmer, add the roux, bit by bit, until you have achieved the thickness you desire. It is unlikely that you will need all of the roux. In my opinion, the stew is more delicious if the sauce is only lightly thickened. Briefly cream the butter and sugar. Beat in the egg yolks and the vanilla. Add the flours and mix until just combined. Divide the dough into three equal portions. The dough may be used right away, or chilled and rolled out later (let it soften slightly before rolling it out). Press each portion into a thick disk. Wrap in plastic and chill until ready to use. For the lemon curd tart you will only need 2 of the disks. The other may be frozen for another use. Combine the sugar, lemon zest and lemon juice in a medium saucepan and bring to a boil over high heat. In a medium-sized bowl, whisk the eggs until homogenous. When the lemon syrup boils, whisk it into the eggs in a thin stream. Return this mixture to the saucepan and place over medium heat. Stir constantly until the mixture is visibly thickened—this will only take about 3 minutes. Remove from the heat and whisk in the butter, piece by piece. When the butter is fully incorporated, turn the curd into a bowl and press a piece of plastic wrap to the surface. Chill overnight. Between 2 sheets of plastic wrap, roll one disk of dough into a round about 1/8-inch thick. Peel off the top sheet of plastic and invert the round of dough into a buttered 9- to 9 1/2-inch removable-bottom tart pan. Ease the dough into the pan being careful not to stretch it and pressing it against the sides of the tart pan. Use your hands to gently press the dough against the upper rim of the tart pan so that the dough is trimmed flush with the pan. Spoon the cold lemon curd into the tart shell. Roll out the second round of dough. Place it on top of the filling. Press the edges together to seal. Place the tart onto a cookie sheet and bake in a preheated 375° oven until the top and sides are golden brown—about 35 minutes. Remove to a rack and let stand for 5 minutes. Brush the top of the tart with the beaten egg white; sprinkle with the sugar. Bake 10 minutes more. Cool the tart on a wire rack. When completely cool, slice and serve with whipped cream and fresh berries. Yum! 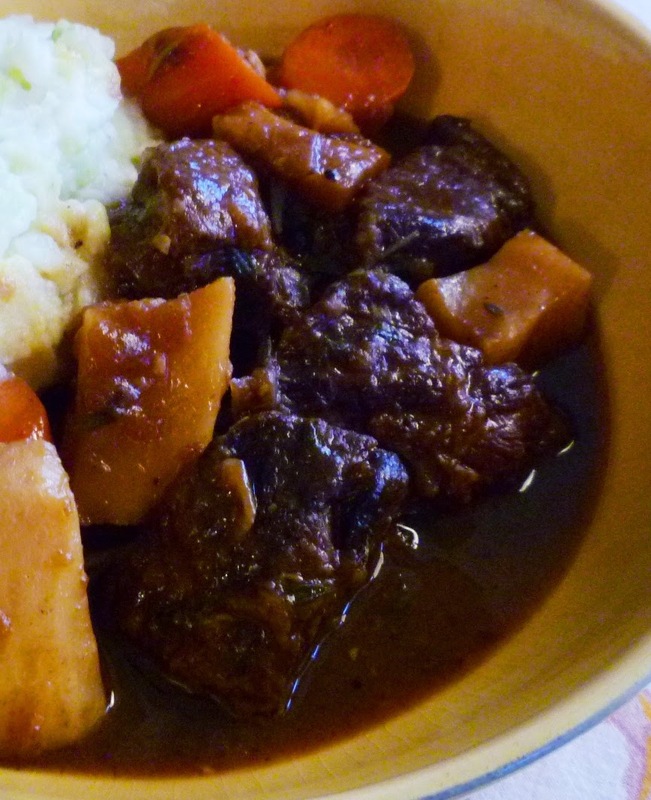 We need to try this stew, as we've had yet more snow! But my question is about the tart. 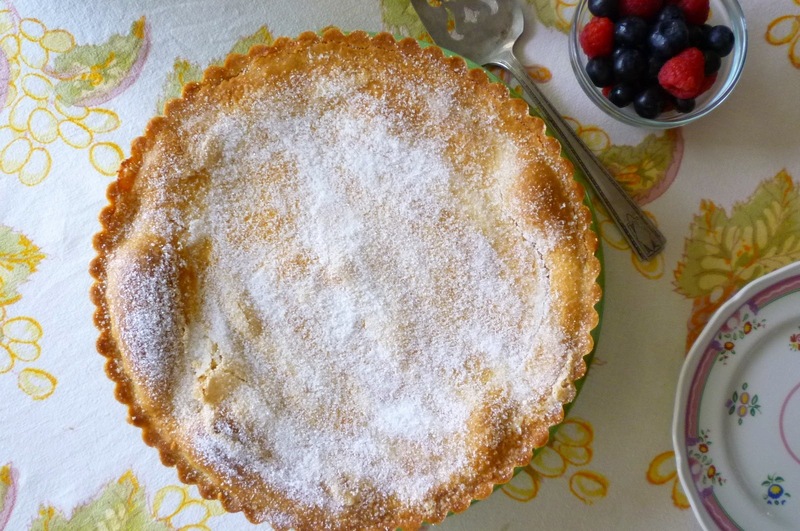 An earlier lemon tart (just one crust) is the same recipe, but with 4 eggs for the curd. Is the difference that this curd can be softer because of the extra crust? P.S. Thanks for including measurements by weight along with volume. Makes me feel more confident about trying something new! You have a good eye! Yes, I have posted a curd that is identical except it has one less egg. I'm not sure I have a completely satisfying answer for you. 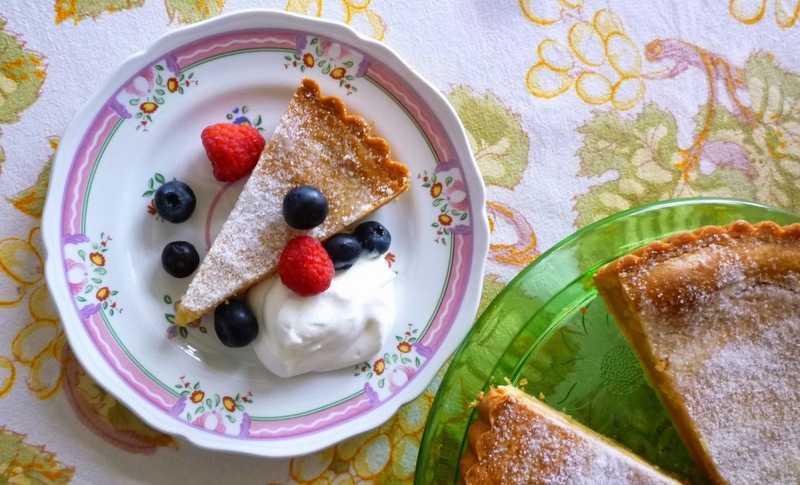 Part of the answer is I have been making this double crusted tart for a very long time...longer than I have had my "go to" recipe for curd, which appears in the other tart. I don't think I noticed the similarity until I had been making both for several years. That said, I imagine the original reason for the lower amount of egg in the double crusted version is that it is in the oven for a much longer period of time--more than twice as long. The curd in the resulting tart is actually much firmer than the one in the single crust tart (even though there is less egg). Another egg isn't necessary to get a nice firm set....and would probably be more likely to curdle. I didn't comment on it in the text, but you'll also notice that there is the five minute break from the oven in the double crust tart. This stops the cooking of the curd and lets it cool down a bit before finishing the sugary crust. If it went straight back into the oven, it would not only boil and ooze out of the crust but would probably break (curdle). Another effect of one less egg is a stronger lemon flavor (since the ration of lemon to egg is higher)...which is nice since you have twice as much sweet crust. Thanks for asking...I should have mentioned all of this in the post. I hope that you enjoy the stew! And I'm glad you appreciate the fact that I list weights with the volume. I wish everyone had a scale and cooked/baked by weights...people would have much more success with their baking if they did! Paige, Thank you! I did notice the break -- but just assumed that you were allowing time to add the sugar without the cook feeling rushed. This is part of what I love about your blog: that you share so many tips and "secrets." All those seemingly "little" things make a difference. Paige, I made the lemon curd tart last week and it was wonderful. I had a little trouble rolling out the dough after refrigerating it overnight. Perhaps I should have left the dough come to room temperature before rolling it out between the plastic wrap. Sure would love any tips that you have. I've never made this kind of tart before and your instructions are marvelous. Thank you! Hi Marianne, I apologize about the instructions for rolling out the dough. Yes, it rolls best when it's at a cool room temperature...letting it sit out for a while to temper is exactly the right thing to do....I will change it in the recipe. This dough is really more of a cookie than a pie crust...so it can be treated exactly like sugar cookie dough that you would roll and cut out. You don't really even need to chill it before using it. I'm so glad you liked the tart anyway! Thanks for letting me know about the difficulty with the roll out so I can fix it in the recipe! Thank you, Paige! I appreciate you explaining it to me. Next time I will just roll it out and bake that day. Yay!